Since every Sunday is a holiday, last Sunday we all decided to hire a car and go exploring some nearby caves. Well nearby is a very relative term in this case, we actually spent all day in the car first going to Elora and then on the way back viewing Ajanta. Overall it was about a 13 hour trip; we left our hostel at about 7:00 am and got back around 9:00. The first set of caves we visited included around 23 Buddhist caves. All of these caves were full of stone carvings and paintings of Buddha in his various poses, and they were all carved from one very large mountain. I can't remember exactly how old they are, but the age of them is very impressive especially considering the conditions that they are in. Although there are places where the carvings have fallen apart, they are all still very well kept. This was also surprising because, unlike in the states, at this incredibly historic site there were only a few of the carvings that were blocked off from curious hands. I constantly felt like I was going to get yelled at for crossing some line that wasn't there, but with a few exceptions there really wasn't much restriction about where you wandered. After staying at Elora for 1.5 hours we were in a hurry to head to Ajanta. However we did not take into account the amount of hawkers that were to follow us to our car. For the entire trip back to our car there were men following us asking us to buy various souvenirs from the cave. Although I regret not getting a book now, I was really overwhelmed by this at the time. At any one time there would be at least three men showing me things and telling me how much I needed to buy them. They followed us to our bus and then when we got off the bus we walked through the shop area (which we referred to as the gauntlet) where the amount of people selling things increased. I think if I had been prepared for this I would have been ready to bargain with these men and get a few trinkets to bring home, but between waking up at 5am, sitting sideways in a car being driven in India for 4 hours, and being overwhelmed by the people I just couldn't do it. I honestly did not know what to do, I felt like I couldn't buy from one person without buying from the others, but now I am prepared for our next outing and I will be ready for the pack of salesmen that are likely to follow me. 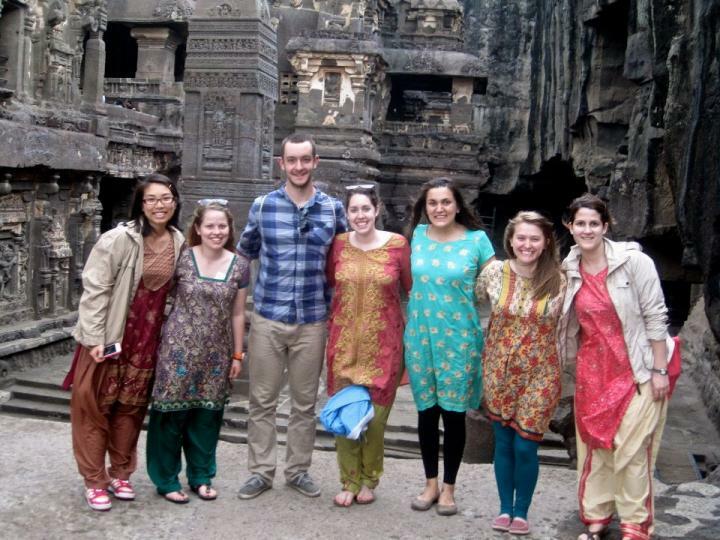 3 hours later we made it to Ajanta around 5:00. We were greeted by monkeys everywhere as we entered the parking lot. There were monkeys in the trees, sitting on the seats of the motorcycles, and walking around in the middle of the parking lot. It reminded me of the scene in Jumanji when the monkeys have taken over the kitchen and are throwing dishes and food everywhere (these monkeys were not quite causing that much ruckus). These caves included Buddhist, Hindu, Sikh, and Jain caves. They were also much bigger than the caves in Elora. There were many carvings of elephants and some tigers, many different gods and goddesses, and then some more elephants. It was incredibly beautiful to see and the vastness of it all made me feel like I was in another world. Grrrreat Aunt KayDel & Uncle Mike So glad you are getting to see some sights in India. It is a REAL Adventure! Uncle Mike What? No Pictures of the Caves?